The EIRA Study: Vaccinations and RA Risk – no Association found! “Common adult immunizations are not associated with an increased risk of developing rheumatoid arthritis” – that is the result of research published in the October issue of The Annals of the Rheumatic Disease, the EULAR journal. Last week that data were also presented at the American College of Rheumatology ACR Annual Scientific Meeting (took place from 6th to 11th November). Common adult vaccinations don’t increase the risk of developing RA, recent results of the Swedish EIRA Study Group say. “Vaccinations are among the events which have long been postulated as inciting agents for rheumatoid arthritis, as well as for many other chronic inflammatory diseases of unknown origin,” lead investigator in the study, Camilla Bengtsson, PhD, stated in her lecture last Monday at the Georgia World Congress Center in Atlanta, USA. “In our case-control study including incident cases of newly diagnosed rheumatoid arthritis, no increased risk of RA following immunization was observed, at least not in the five years prior to disease onset”, the epidemiologist at the Institute of Environmental Medicine at Karolinska Institutet in Stockholm, Sweden, explained in more detail, noting that the study is still ongoing. From Dr. Bengtsson’s point of view these results are indicating that immunological provocation with commonly used vaccines in their present form do not carry a risk of rheumatoid arthritis in adults. “Since rheumatoid arthritis has a hereditary component, our results are reassuring, not only for the population in general, but especially for children and other relatives of patients with RA,” the Swedish lead investigator said at the 2010 ACR scientific meeting. The data is based on the Epidemiological Investigation of Rheumatoid Arthritis, the EIRA study. That study, Camilla Bengtsson explained in more fully, is an ongoing, population-based, case-control study in Sweden designed to investigate associations between genes as well as environmental factors and the risk of developing rheumatoid arthritis. The EIRA study began in 1996 and includes scientific data from more than 8,000 subjects. That means that the EIRA study is one of the largest etiological rheumatoid arthritis studies in the world, according to Camilla Bengtsson’s lecture at the 2010 ACR scientific meeting. And this is how the researchers have designed the vaccination study: They compared 1,998 rheumatoid arthritis patients who were immunized within the five years prior to disease onset to 2,252 participants with rheumatoid arthritis (RA) who were not vaccinated. Each group was matched based on age, gender and place of residence, and all participants were between 18 and 70 years old. Camilla Bengtsson and co-workers found no association between injections and the development of rheumatoid arthritis. Furthermore, they found no association between any specific vaccine – e.g., influenza and tetanus vaccination, diphtheria inoculation, tick-borne encephalitis, hepatitis A, B, C together, polio vaccination, flu shots, or pneumococcus vaccination – and the risk of developing rheumatoid arthritis. From a scientific point of view it is an interesting approach, I think, that the study also examined whether vaccinations have a different impact on two groups of participants. Camilla Bengtsson and co-workers examined those subjects with ACPA-positive and those with ACPA-negative rheumatoid arthritis – and they found that the vaccines did not increase the risk of either disease form. By the way: You will find more information on ACPAs and ACPA testing in the respecting wikipedia article. Furthermore, you will find a bibliographical reference on Anti-MCV and antibodies against citrullinated protein/peptide antigens (ACPA) on the ORGENTEC website. I have to admit that it has been a while I have updated that list of literature about the ACPA topic. But it still is current, and I will take the opportunity to revise that list soon. Genes of RA susceptibility, environmental factors and vaccinations – risk for RA? Let’s go back to the results of the Swedish EIRA study group. – The researchers did also investigate the association between genes as well as environmental factors and the risk of developing RA. Finally, they noted that vaccinations did not elevate the risk of developing rheumatoid arthritis among participants who smoke and among participants who are carriers of HLA-DRB1 SE alleles both of which are established risk factors of rheumatoid arthritis. Concerning the topic “cigarette smoking and rheumatoid arthritis”, see my article posted on the ORGENTEC Autoimmunity Blog on 21/05/2010: There is a Connection between Rheumatoid Arthritis (RA) and Smoking – what are the Reasons? and the Research Update article by my colleague Friederike Hammar posted on 07/04/2010: Genetics of Rheumatoid Arthritis Susceptibility . . 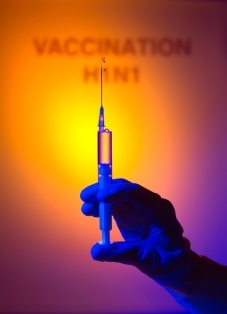 The stock foto Vaccination. is taken from stck.xchng, thanks to Leonardini. Arthritis and related diseases are also known as rheumatic diseases. This term describes diseases of the joints, muscles and connective tissues, each having different causes. There are some very serious forms of arthritis that are called autoimmune diseases. In these diseases, the body’s immune system malfunctions. for this reply. It’s absolutely right what you wrote. I visited The Health Informer website, it’s pretty good information you’re offering there. Keep it up! – On the page Autoimmune Diseases on this blog (http://autoimmunityblog.wordpress.com/orgentec-autoimmunity-blog-autoimmune-disorders/) you’ll find information and some links about several autoimmune diseases. This page is currently under construction, but feel free to reuse that content even now if it’s for the benefit of The Health Informer Blog.